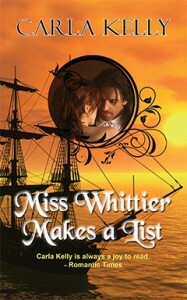 Miss Whittier Makes a List ($14.95, 252 pp., ISBN: 978-1-60381-897-1), is a reprint of a regency romance by “the Grandmistress of the [Regency] genre,” (Romantic Reader) Carla Kelly. Ms. Kelly is the recipient of two RITA Awards from Romance Writers of America for Best Regency of the Year; two Spur Awards from Western Writers of America; a Whitney Award for Best Romance Fiction, 2011; and a Lifetime Achievement Award from Romantic Times. “I wish I had the words to really give the flavor of this remarkable novel. I can start by saying that I had a smile on my face almost through the whole of it. Hannah is the most delightful creature who never hesitates to speak her mind. The captain is stern and reserved, and while no one could honestly call him a softy beneath it all, we begin to see the whole man …. Even with a suspenseful plot, MISS WHITTIER MAKES A LIST is a fun book. Many minor characters add entertainment and sympathy to the whole. I highly recommend this lovely tale to you.” Read more …. First published in 1994, this shipboard romance takes place thirty years after the U.S. Revolutionary War, when England was fighting a world war with Napoleon’s France, and the neutral United States was at cross-purposes with both. In coming months, Camel Press will also reprint Miss Chartley’s Guided Tour and Miss Billings Treads the Boards. Camel will also be publishing Carla’s new series called The Spanish Brand. Book 1, The Double Cross, will be released in August of 2013. In the early 1800s, seventeen-year-old Hannah Whittier is traveling by ship down the coast from her Quaker home in Massachusetts to her brother’s house in Charleston, South Carolina. To while away the dull hours, Hannah composes a list of qualities she wants in a husband. Boredom will soon be the least of her worries. First the Molly Claridge is boarded by the British frigate, H.M.S. Dissuade, and forced to turn over any supposed Englishmen. Later the American vessel is blown out of the water by a French man o’war. After a long, harrowing day clinging to a grate and battered by the sun, Hannah is fished out of the water by the Dissuade and forced to sail toward England with the British crew and its imperious yet devilishly handsome captain, Sir Daniel Spark. Proper young Quakeress Hannah locks horns with salty Captain Spark, who expects her to carry her weight by helping their cook and keeping watch. The captain has none of the qualities on Hannah’s list, so why is she so drawn to him? Could it be that loyalty and valor are more important than mild manners and patience? Hannah learns that Captain Spark has fought valiantly in England’s naval battles against France, and she sympathizes with his weariness in the face of so much death and destruction. Captain Spark in turn values Hannah’s lively spirit and positive attitude. And, despite her tanned skin and cabin boy attire, Hannah presents quite a temptation to the captain who has been too long at sea. Now, if only they can make it to England in one piece …. A well-known veteran of the romance writing field, Carla Kelly is the author of twenty-six novels and three non-fiction works, as well as numerous short stories and articles for various publications. Carla’s interest in historical fiction is a byproduct of her lifelong interest in history. She has a BA in Latin American History from Brigham Young University and an MA in Indian Wars History from University of Louisiana-Monroe. The impressed seamen were quickly bundled over the side and hauled up onto the other deck. Captain Winslow dropped to his knees and wept, his head in his hands. It was more than Hannah could bear. She jumped up again and ran to the British captain, who waited to reboard his vessel. She grabbed his arms and tried to pull him around. “Thee cannot do this! Have we no rights?” She tugged his arm, but he was anchored fast to the deck and would not budge. She did as he said and wiped her streaming eyes with her sleeve. “I wish thee to hell, sir,” she said, her voice as quiet as his and more fierce. “Well I won’t go, Miss Spitfire,” he replied. To her utter amazement, he grabbed her by the mass of hair on the back of her neck, hauled her close, picked her up, and kissed her. Her feet dangled off the deck and she grabbed onto him to take the pain off her hair, while he kissed her once, and then again more thoroughly. She clung to him, her head on fire, and tried to speak, even as he kissed her a third time, completely in command of the situation. Wild-eyed with fury, she stared at him, noting even in her rage how improbably long his eyelashes were. His eyes were closed, and he seemed to be enjoying himself immensely. He sprang to the railing, his arm draped gracefully in the rigging to maintain his balance, and then leaped across the space between the ships as his men laughed and cheered. As she watched in total humiliation and stunning fury, the sailors on the opposite ship grinned at her and released the grapples from the Molly’s mutilated railing. The vessels moved apart quickly.